Today I found myself in a client office of a run down west midlands town near Birmingham. As the pangs of lunchtime hunger take hold I take to the High Street. My rationale? It won’t be as bad as all that. A worker in the office asked what time I was staying until? Before I answer he says “get out before four o’clock.” He doesn’t say why. After perusing the delights of Wilkinson – 5 paintbrushes for £2 – I settle upon Wino’s café for lunch. (That’s one letter astray from it’s actual name, yet rather closer to reality.) The reason for this choice is that belief that local businesses should be supported, culinary gems are oft overlooked and you’re not really getting a flavour of a town by feeding in an identikit eatery. On this occasion only the latter holds up to scrutiny. Call me a snarky puppy if you like – although they are an amazing band – but I have just had the most depressing, soulless lunchtime experience. When Europeans, Americans et al complain about British food these days, I get all uppity and defend some of the amazing scoff we churn out (privileged as I am to have savoured it). However, if they’d have eaten here as their sample I’d be throwing myself under a bus in sympathy. Above the counter are those hi-vis starburst cards with legends including “Soup, Bread & Butter (Asst Varieties) £1.99” and “Tins of Pop 95p”. Behind the counter is a worker who, on first acquaintance, appears to have melted. Nope, just a lot of miles on the clock. On closer inspection I become alarmed that she was in the last throes of dying right in front of me. Surely not? Hidden cameras? A spoof? She’s not moving… Momentarily I become convinced it was a low budget science-fiction scene where those around me are trapped in some evil slo-mo hell. A panicky glance out to the street proved that time, at least outside this weird new dimension, is passing normally. The glacial movement, then tortured process of mishearing, re-asking, eventually taking an order and writing it down. The asking for the money then crawling to the till then coming back with the change then going back to the till then taking the written order and asking if there was “pie” “yes chicken” “is that awlroight?” Yes it is” then handing over the order slip. It was all I could do not to SCREAM. In time, I am left standing with my scrap of paper with the number 10 on it. I didn’t ask for a till receipt: now I can’t face it. I select the least sticky table and sit. I blend in by carefully arranging my Wilko bounty in a display of visible camouflage and drool quietly with my mouth half open staring into space. I survey fellow diners. A startling collection of teen Mums and trolley dragging blue-rinsers. The radio plays a mix of bland pop and grating static. My head throbs. Time passes. I am a little closer to death. Then a member of staff of indeterminate gender/age yet considerable girth – replete with a bemusing food-preparers hairnet – arrives with an oval plate groaning with pie, chips and gravy. With effort I straighten the tines of my cheap fork. I dig in to the steaming repast and am rewarded with the most rapid case of indigestion in the developed world. I expect I have gone a funny colour. I consider a “tin of pop” and then realise I’d be dead by the time she got to the fridge and back. I ride it out. Time passes. Nobody notices. I slowly eat some more. I get up, collect my Wilko bags and leave, never to return. We are very lucky in this country in so many ways. In addition, I consider myself lucky I don’t live here. Epilogue: The cafe is for sale for £37k. No, wait: do. Then immediately shut it down. When you are booked in to a hotel that goes under the moniker of “The Palace” it’s going to go one of two ways. In Madurai, Tamil Nadu, India the Beers were booked in to “The Hotel Supreme”. On that occasion it was as bad as it gets: the putrid breakfast, the power cuts, the 05.00 PA system playing 110db distorted Bollywood hits outside. Great views from the roof terrace though. The Palace Manchester on the other hand is, well, palatial. On previous business trips, this hotel was considered too upmarket for the likes of I. The present employer has clearly cut a great deal: lower cost, I note, than the Premier Inn rate. Like so many of the truly splendid buildings around the city, The Palace is a proud, Victorian red-brick affair. Ducking inside from the typically cold and damp Oxford Street you are into a marbled, pillared, tiled, glass-vault-ceilinged lobby replete with mood lighting that is, er, moody. In the bar/restaurant area, there is a mix of angular modernist furniture, more moody lighting and Victorian splendour in sky-high ceilings draped with fabrics in – I imagine – a chic manner. It works. After a tasty, spicy dinner from an indigenous eatery – a Burrito shop – around the corner, I repair to the hotel bar for a pot of tea with a chocolate and almond torte. Rock and roll eh? The latter is served on – effectively – a dusty old slate. Yay, modern cuisine! I wolf it down whilst reading the paper. It’s such a treat to sit in a space like this: to have space and time to myself on a school night. I drink in the surroundings with my cuppa when it strikes me: what’s really catching the eye is the tiling. Yes, tiling. The walls of the corridors and public areas are tiled with thousands of glossy, wet-look oblongs that are irresistible: you have to touch them. Even the columns in the reception are glazed earthenware and the deep tones in the corridors – deep greens, burgundy reds – give a lovely feel. A quick research and whaddya know, it used to be an Insurance Company HQ. (Shades of Edinburgh here.) 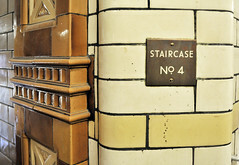 For a time it was considered by architecture critic John Parkinson-Bailey “one of the most prestigious and expensive buildings in Manchester lay forlorn and empty except for a caretaker and the ghost on its staircase.” In 1996 the spent £7million making it the splendid hotel it is now. Then we get to the real downside. I’ve stayed here before and on that occasion had a chic upstairs room with a juxtaposition of Starck-esque chaise-longue and (more) shiny tiles. On this occasion it’s a long, convoluted walk down and down to room seven. If palaces have their beautiful rooms and grandeur, they also have dungeons. When you walk into a room and notice the secondary glazing/et curtains first, alarm bells tinkle. Through the grubby outside windows there are parked cars in the gloom. Look up and the arches of the railway are apparent. Oxford Road station is above us across the street from the entrance after all. With perfect timing (what I take to be) a freight train rumbles overhead. Tee hee. Let’s not get this out of perspective: the room is warm, clean, dry and comfortable enough. It’s just such a let-down considering the grander areas of the hotel. Corporate hotel bookings eh? I’m just happy to be in Manchester again. It’s a town that I’ve got to know over the years and I revel in its gritty industrial revolution spawned architecture, proud population and infrastructure. Wandering around the canals, dodging modern trams, admiring the older buildings, ducking under the railway arches, going for a beer in an old pub. Then there’s the brash cars, the upfront locals, the rude new buildings and its unique sense of style. All whilst humming Elbow to myself. Even from a dungeon I love this town.